This document contains requirements and instructions on how to install Softerra Adaxes 2018.2. The tables below outline software and hardware requirements for different Softerra Adaxes components. * It's highly recommended to install Web Interface and SPML Web Service on the server editions of Windows, because when installed on a workstation, IIS has a limitation on the number of simultaneous connections. The connection limit can be reached when only two or three people are using the Web Interface at the same time. Important: To install Softerra Adaxes, the computer must be joined to an Active Directory domain. Note: Hardware requirements depend on the total number of objects managed by Adaxes. All Adaxes components require Microsoft .NET Framework 4.5.2 or higher. To install Adaxes Service on Windows 7, you need to install Active Directory Lightweight Directory Services (AD LDS) first. Adaxes PowerShell Module requires Windows PowerShell 3.0 or higher. Log on to the operating system using an Active Directory domain account that has local administrator permissions on the computer. Install Microsoft .NET Framework 4.5.2 or higher, if not installed. Read the information provided on the Welcome screen and click Next. Select the Adaxes components you want to install and click Next. If you select none of the Adaxes components, only Adaxes ADSI Provider will be installed. On the Adaxes Service Account page, specify the credentials of the user account under which the Adaxes service will run. It is recommended to have a dedicated account to run the Adaxes service. To change the account you'll need to reinstall the Adaxes service. The Windows service for Adaxes will use the account to log in to the system. The account will have full access to Adaxes configuration and all Active Directory domains managed by Adaxes. The AD domain where the Adaxes service account is located will be automatically registered to be managed by Adaxes. The Adaxes service account can be used as the service account for a managed Active Directory domain. Since all operations within a domain are performed using a service account, it must have sufficient rights in the domain. If you want to use the Adaxes service account as the service account for a domain, you need to add it to the domain Administrators group. If the Adaxes service account doesn't have administrator rights, it should have the rights necessary to publish and unpublish the Adaxes service in Active Directory (create/delete a Service Connection Point). For information on how to grant the necessary permissions, see Grant Permissions to Publish Adaxes Service. Since Adaxes service uses the Adaxes service account to log on to the system, the Log on as service right is granted to the account. When the Adaxes service is installed on a workstation rather than on a domain controller, the right is granted locally on the workstation via the Local Policy settings. If there is a conflicting domain-based Group Policy object that grants the Log on as service right to other accounts, the local right granted during the installation process will be removed on Group Policy refresh, because the domain-based Group Policy settings override the Local Policy settings. If it happens, the Adaxes service will not start, and the Log on as service right will need to be granted to the Adaxes service account in a precedent domain-based Group Policy. 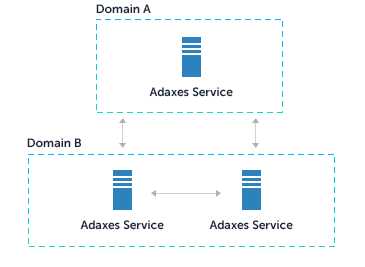 On the Service Configuration page, to achieve fault tolerance and load balancing, you can join the new Adaxes service to an existing Adaxes configuration set. For more details, see Multi-Server Deployment for High Availability. To join the Adaxes service to a configuration set, select the Shared configuration option, specify the DNS host name of any Adaxes service from the configuration set, and then provide the credentials of the service account of any Adaxes service contained in the configuration set. On the Ready to Install page, you can specify whether to open the Windows Firewall port that is used for communication between Adaxes clients (e.g. Adaxes Administration Console or Adaxes Web interface) and the Adaxes service. If the Open port 54782 in Windows Firewall option is selected, an inbound rule for port 54782 will be added in Windows Firewall. If you uninstall Adaxes, the rule will be deleted automatically. On the Web Interface Configuration page, configure IIS web site parameters for the Web Interface and Web Interface Configurator. The list of Web Interface types available on a specific web server is determined by the configuration of each Web Interface type. For example, if you don't want the Web Interface for Administrators to be available from the outside, you can disable it on all web servers located in the DMZ. For more details, see Disable Web Interface on Specific Web Servers. On the Service for Web Interface step, specify the DNS host name of the Adaxes service the Web Interface will connect to. The step is only available if you install the Adaxes Service and Web Interface components separately. 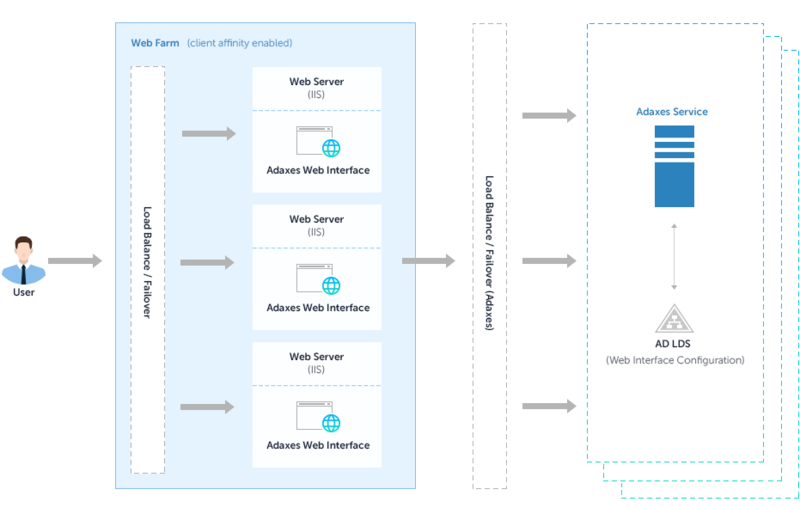 When both components are installed simultaneously, Web Interface will connect to the Adaxes service installed during the current installation. 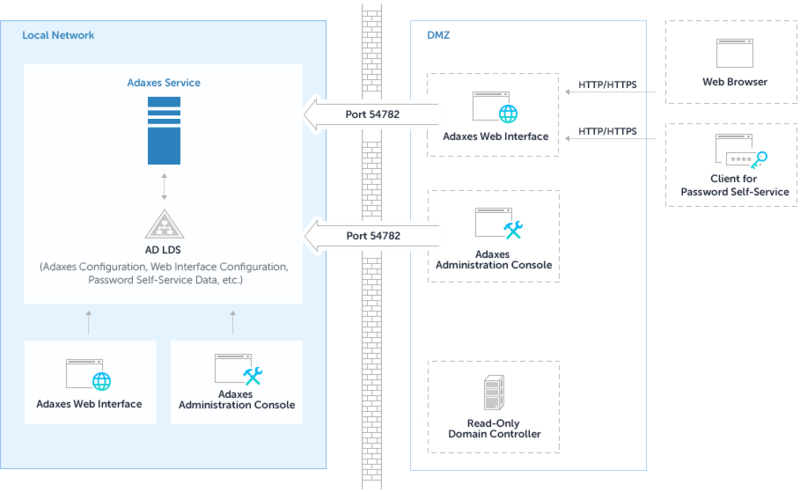 If the Adaxes service shares its configuration with other Adaxes services, the Web Interface will connect to the nearest available Adaxes service contained in the configuration set. On the SPML Web Service page, configure IIS parameters for the SPML web service and click Next. On the AD Access for SPML Web Service page, specify how you want Adaxes SPML Provider to access Active Directory. The page is only available if you install the Adaxes Service and SPML Web Service components separately. When both components are installed simultaneously, SPML Provider will use the Adaxes service installed during the current installation. Adaxes SPML Provider can access Active Directory directly or via an Adaxes service. Accessing Active Directory via Adaxes allows you to benefit from the Adaxes features like Business Rules, Security Roles and Property Patterns. If SPML Provider connects to Active Directory through an Adaxes service and the service shares its configuration with other Adaxes services, SPML Provider will connect to the nearest available Adaxes service contained in the configuration set. Depending on the features you've selected, additional components can be installed on the system. For details, see Additional Components. After Adaxes is installed, you need to perform some post-installation steps. You can set up multiple Adaxes services that share common configuration (managed AD domains, Security Roles, Business Rules, Scheduled Tasks, Web Interface configuration, etc.). In a multi-server environment, if one of the Adaxes services goes down, users are automatically redirected to the nearest service available. It enables fault tolerance and provides more efficient load distribution on your system. Adaxes services that share common configuration form a logical grouping called a configuration set. When the configuration of an Adaxes service is modified, the configuration of other services in the configuration set becomes inconsistent with the most up-to-date configuration. 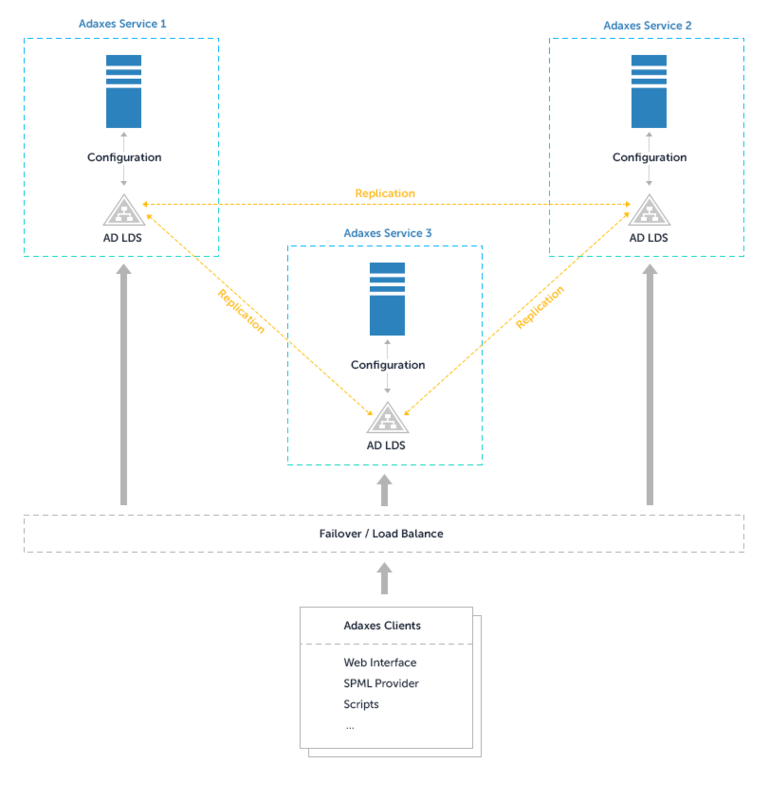 As the changes get replicated through the configuration set, all service configurations become identical once again. Adaxes uses a type of replication called multimaster replication. Consider a multi-server deployment if you have a geographically distributed environment, there is a heavy load on your Adaxes service, or you want to achieve extra availability and improve the failover. During installation of subsequent instances of Adaxes service, join each new service to the configuration set. For this purpose, on the Service Configuration page of the installation wizard, select the Shared configuration option and specify the DNS host name of any Adaxes service from the configuration set. To join a service to a configuration set you will need to provide the credentials of the Adaxes service account of any Adaxes service contained in the configuration set. By default, Adaxes log records are stored in a SQLite database located on the computer where Adaxes service is running. Since SQLite databases are not replicated, each instance of Adaxes service will have access to its own log records only. In a multi-server environment it is highly recommended to use Microsoft SQL Server as an external database for log records. 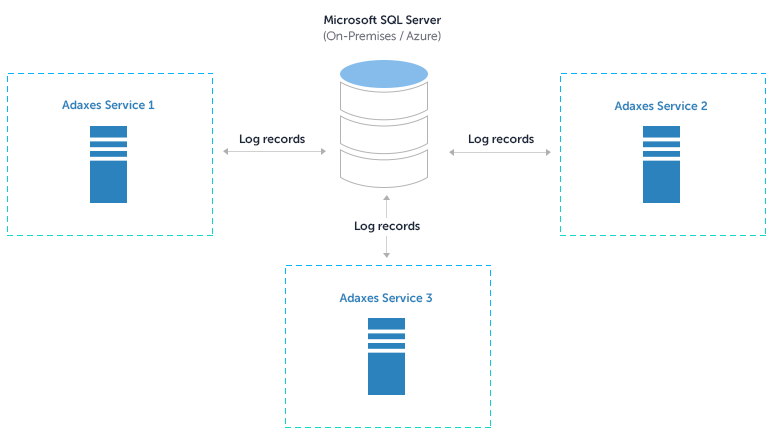 In such a configuration, all records will be merged in a single database and each Adaxes service will have access to all log records generated within the configuration set. For instructions on how to configure Adaxes to use an external database for logging, see Enable Logging to External MS SQL Database. Install Adaxes Web Interface on each web server in the web farm. msiexec /quiet /i "adaxes_x64_en.msi" ADDLOCAL=AppWebUIFeature ADMWEBSERVICECONFIGSET="<CONFIG-SET-ID>"
<CONFIG-SET-ID> is the identifier of the Adaxes service configuration set. For details, see Get the Configuration Set ID. msiexec /quiet /i "adaxes_x64_en.msi" ADDLOCAL=AppWebUIFeature,AppConfigWebUIFeature ADMWEBSERVICECONFIGSET="<CONFIG-SET-ID>"
Important: In order to upgrade the Web Interface, the update must be applied on each web server in the farm. Configure client affinity for the web farm. Since Adaxes Web Interface requires all client requests to be routed to the same web server during a client session, you need to configure load balancing to map a client to a Web Interface. The load balancing algorithm must be applied only for the very first request from the client. From that point on, all subsequent requests from the same client must be routed to the same Web Interface for the duration of the client session. Go to the Citrix NetScaler VPX configuration page. Select the virtual server you use for load balancing and click Edit. In the Persistence list, select the SOURCEIP option. To make Adaxes Web Interface and Administration Console available from outside, they can be installed in the DMZ (also known as perimeter network or extranet). Web Interface can be exposed to the Internet to allow users to perform tasks like password reset and directory search when they are not on the internal network (e.g. users working from home, users on a business trip, external users). If you install Adaxes Administration Console on a computer in the DMZ, Administrators will be able to connect to the computer using Remote Desktop and manage Adaxes and Active Directory from outside the internal network. Install a Read-Only Domain Controller in the DMZ. Adaxes Web Interface and Administration Console can be installed only on a computer that is joined to an Active Directory domain. Since DMZ is usually a highly restricted piece of network, it is recommended to use Read-Only Domain Controllers. Read-Only Domain Controllers provide a one-way replication from your internal network to the DMZ and thus decrease the risks when a DMZ machine gets compromised. For details on how to deploy read-only DCs in the DMZ, see Active Directory Domain Services in the Perimeter Network. Open the folder where Adaxes service is installed, typically C:\Program Files\Softerra\Adaxes N\Service. Open the Softerra.Adaxes.Service.exe.Config file in a text editor. Configure which Web Interface types will be available in the DMZ. For example, if you don't want Web Interfaces for Administrators and Help Desk to be available from the outside, you can allow them only on the web servers located inside your local network. For more details, see Disable Web Interface on Specific Web Servers. If you do not want to install a read-only domain controller and Adaxes Web Interface in the DMZ, but still need to make Web Interface accessible from outside, you can use an application delivery controller (e.g. Citrix NetScaler, Nginx, CloudFare, etc.). For example, the controller can be placed in the DMZ to accept requests from outside and pass them to the Adaxes Web Interface installed in your local network. Create a website for Adaxes Web Interface using Quick Create. Select the new website and switch to the Configure tab. Make sure .NET Framework Version is set to V4.5. Set Managed Pipeline Mode to Integrated. Set Custom Application Pool Identity to Allow. Provide the username and password of an Active Directory account that the website will run under. It is recommended to use a low-privileged domain account for the application pool identity. Upload Web Interface files to the site\wwwroot directory of the new website (e.g. using FTP). The Web Interface files are located in the C:\Program Files\Softerra\Adaxes N\Web Interface\App folder on a computer where Adaxes Web Interface is installed. If Adaxes Web Interface and Adaxes Service are installed on the same computer, you need to install Web Interface on a separate computer and get the files from there. Before uninstalling Adaxes Service, you may want to back up its configuration. For this purpose, use the Softerra.Adaxes.BackupRestore.exe tool. The tool is located in the folder where Adaxes service is installed, which is C:\Program Files\Softerra\Adaxes N\Service by default. If you want to uninstall the Adaxes Service component, make sure that the service is running. It is necessary to correctly unregister the service from your system (remove the service connection points and clean up the configuration set metadata). Uninstall the old version of Adaxes service. On the computer, where the previous instance of Adaxes service was installed, go to the common application data folder used by Adaxes. It is typically located at C:\ProgramData\Softerra\Adaxes N\. Copy the folder to a similar location on the computer to which you are transferring Adaxes service. Back up the configuration of your Adaxes service using the Softerra.Adaxes.BackupRestore.exe tool. The tool is located in the folder where Adaxes service is installed, which is C:\Program Files\Softerra\Adaxes N\Service by default. When upgrading from 2017.2 and earlier, you need to back up the configuration of your Web Interface using the Softerra.Adaxes.Web.UI.Configuration.exe tool. The tool is located in the folder where Adaxes Web Interface is installed, which is C:\Program Files\Softerra\Adaxes 3\Web Interface by default. Starting from 2018.1, the Web Interface configuration is a part of Adaxes service configuration and you don't need to back up and restore it separately. Restore the Adaxes service configuration using the Softerra.Adaxes.BackupRestore.exe tool. When upgrading from 2017.2 and earlier, migrate the old configuration of your Web Interface using the Softerra.Adaxes.Web.Migration.UI.exe tool. The tool is located in the folder where Adaxes Web Interface is installed, which is C:\Program Files\Softerra\Adaxes N\Web Interface by default. If you have different Web Interface configurations installed on different web servers, migrate each configuration one after another, and then specify which Web Interface configuration will be available on which web server. For details, see Disable Web Interface on Specific Web Servers. Some of the Adaxes components require additional software to be installed. All the software is installed automatically during Adaxes installation. The software components that are going to be installed are listed on the Ready to Install page that is shown right before the installation process starts. Note: After Adaxes is uninstalled, the additional components installed automatically remain in the system. Connect to the domain of the computer on which you want to install Adaxes. Right-click the computer on which you want to install Adaxes, and then click Properties. Type the name of the user account to which you want to grant the permissions and click OK.
© Softerra 2018. All rights reserved.